Less than a day after Germany's leading economic institutes cut its growth outlook for the already struggling German economy, Italy is out with a disappointing guidance cut of its own, making a mockery of last year's EU negotiations with Italy to slash its deficit spending, which as everyone knew were nothing more than a farce. Italian stocks tumbled on Thursday after the Italian Treasury once again slashed its forecast for economic growth for 2019, bringing the projection down to just 0.1% for the year, down from 1% previously. With growth expected to be flat for the coming year, the populist government of Europe's third-largest economy now anticipates that its budget deficit will expand to around 2.3% or 2.4% of GDP, a level that was unacceptable to Brussels during the battle over the populists' proposed fiscal stimulus efforts that nearly brought the founding EU member to the precipice of 'Italeave'. Now, just four months after Italy and Brussels reached a tenuous accord, the populists are finally coming clean, much to Brussel's chagrin, we imagine. 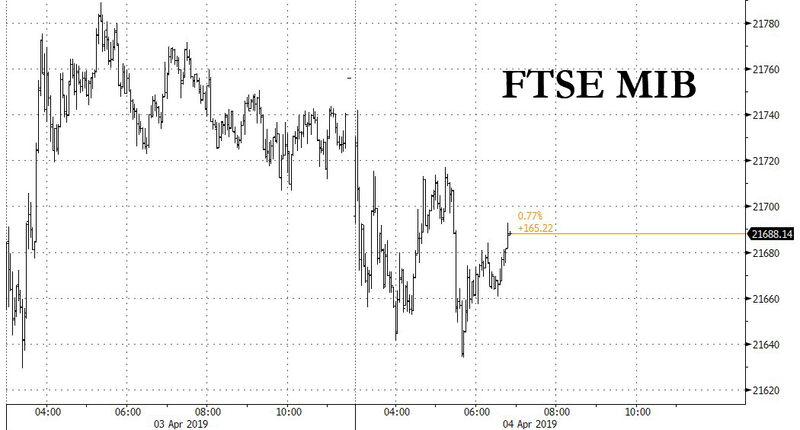 The FTSE MIB fell 0.6% on the day, hitting session lows, after the forecast, weighing on broader European stock indices, as banking stocks like UniCredit led the way (though UniCredit was also under pressure from reports that it was considering a bid for Commerzbank). The news also weighed on the euro, though both the currency and Italian stocks have steadily pared their losses, while Italian bonds rallied. Despite the gloomier outlook, the Italian government is still targeting growth of 0.3% to 0.4% for the year, but amid a broader slowdown in the global economy that even officials like the IMF's Christine Lagarde have acknowledged is "losing momentum," that figure could be difficult to achieve. Compounding Brussels' frustration with Rome, the cut follows Italy's controversial decision to join Beijing's"One Belt, One Road" initiative, becoming the first G7 nation and first founding EU member to join the "neocolonial" project. The forecast cut couldn't have come at a worse time, as the English-language financial press was once again shining a spotlight on Italy's unsustainable debt burden - which Brussels fears will only worsen as the populist coalition ruling the country has decided the more deficit spending is the only way to jumpstart Italy's moribund economy. As one Bloomberg commentator wrote just hours before the guidance cut was announced, "Italy’s public debt of €2.4 trillion ($2.7 trillion) is significantly bigger than its economy and among the largest in the currency union, making it the most dangerous. This debt mountain threatens the financial stability of Italy and the future of the euro: Any plans to strengthen the single currency must solve the question of who will bear this burden." As his term at the helm of the ECB draws to a close, it appears Mario Draghi's last few months at the heead of one of the world's most powerful central banks could be marred by a scramble toward further monetary easing as he desperately tried to right a listing European economy - at least, if the last ECB meeting was any indication.